"Beyond the planet on which we stand... beyond Venus... beyond Mercury... at the very center of our Solar System, lies a source of immense power. Throughout history, that power is often regarded as a benevolent force. It lets there be light. It gives us energy. It gives us hope. It is a necessary source of all life. And its radiant appearance in the heavens marks the end of the rain that we all hate. But that very energy source... we also dread it for a reason.... for not only does the heat that it provides evaporate our precious water, weakening its power and furthering our thirst and dehydration, one of the easiest causes of death... but it is also the very energy that allows my Pokémon to recreate Hell on Earth! Drawing from the power of that omnipotent star... this team of mine will incinerate your Pokémon to ashes!" To start off, I would like to introduce myself. I am CHAMPION LANCE, who stands alongside my great friend aLiEn Mw as one of the two leaders of the proud Dragon Rush clan, the strongest clan to have ever graced the world of competitive Pokémon. Having technically started battling competitively since 2000, there is a chance that some people here may have encountered me under different names on the internet before within the past twelve years, given that this forum is dedicated to the most popular online Pokémon battling simulator of today, and as such is nothing short of an ultimate congregation of people from a myriad of communities previously scattered across the internet without any form of unity aside from their interest in Pokémon. Pokémon NetBattle, Pokémon NetBattle Supremacy, Shoddy Battle, Dragon Rush, Smogon, THE Alternative, Serebii, GameFAQs, Neoseeker, PokéCommunity, and Bulbagarden are just a few of the many places from which the members of the Pokémon Online forum may have their origin, and from those communities, you may have encountered me in the past under some of my most well-known names across the internet. Some may remember me as Master of DaUniverse, the mysterious and legendary Pokémon trainer who achieved a win-loss record of more than 200 victories (in fact, around 384 on the Battledome server) and around only 10 defeats on four different servers in Generation II battles on Pokémon NetBattle back in 2004. Judging from how long ago that was, I doubt many here would have any recollection of that though. Others may remember me as PokéMaster Forever, the embodiment of courage and preseverence in the world of competitive Pokémon, who challenged the community of Smogon countless times regarding many of their most commonly-accepted beliefs and rules through various methods, including debate on the Smogon forums and the deliberate disregard of many rules that he viewed to be unjust in the battles he had on Pokémon NetBattle, despite his knowledge of the persecutions that he would face for such actions. Some others may know me as DragonNinja1337 on GameFAQs or Dragon Champion on Pokémon NetBattle in 2006, one of the most revolutionary figures in the competitive history of Pokémon Generation II, who created countless unique movesets for Pokémon in that generation, such as LunarLight, Kazeryuu and Luckpwner. More likely than the aforementioned, some may recognize the name "Pokémon Master Ryuumaru", the skilled dragon tamer of Generation II, and was at one point even featured on Wikipedia, with an article dedicated to him. Because of the comical nature of my actions under that name, certain people who used Pokémon NetBattle back in 2006 and 2007 may remember me as "Rayquaza Master" or "Arcanine Master", a trainer well-known for breaking Species Clause without so much as batting an eyelid. Those who have their origins from the corrupt community of Neoseeker may recognize me as "ACCLAIM", "Dragonaurus", "Dragon Swordsman" or "DragonMaster ACCLAIM", one of the most knowledgeable and insightful contributors to that site in the past regarding Pokémon. Those who stayed loyal to Pokémon NetBattle (or its successor at the time, Pokémon NetBattle Supremacy) in 2009 despite the advent and popularity of its main competition back then, Shoddy Battle, may remember me under the very name I am using right now: CHAMPION LANCE, the name under which I stood as the sole Administrator of the POKéMON LEAGUE server, a server designed to test the skills of my opponents against the most powerful team I have ever wielded in the history of my Pokémon battling career, in a Generation IV battle. Either that, or [DR] The Champion, the name under which I have won countless Generation IV tournaments on various popular NetBattle Supremacy servers. And last but certainly not least, those who have participated in the DW Ubers ladder on the Pokémon Online server within the past few months would more than likely have battled a user under at least one of the following names: Th3 R0ck3r, Teh PohkhehGawd, Demon Lord Ghirahim, Chrysalis Aizen, Butterfly Aizen. All five of the aforementioned names (ranked #1, #2, #4, #7 and #9 respectively as seen in the screenshot of the DW Ubers ladder shown above) are all me. Each of those five names also utilized a completely different team, too. The reason why I do not contribute to "Rate My Team" threads is simple. The purpose of replying to such threads (aside from the fact that such a term is actually a misnomer, because if one were to take this term literally, then a reply to a "Rate My Team" thread should really consist of nothing more than a number out of 10, with the number's value being determined by the rater's perceived quality of the team) is to suggest changes to the team posted by the topic creator, with the goal of helping the topic creator improve his or her team. However, not once in my life have I ever seen anyone post any rules regarding the limit of what may be suggested in one's attempt to "rate" a team. For example, suppose that a person wants his OU team to be rated. That team consists of three solid OU Pokémon, as well as three Pokémon which clearly would not be useful at all in the OU environment, say a Caterpie, Magikarp and Feebas. In my attempt to "rate" such a team, should I be allowed to suggest that the topic creator remove those three Pokémon, and replace them with three Pokémon which would clearly help the team's performance in battle a lot more? If I am not allowed to do that, then rating the team in the first place would be pointless, as it is quite safe to say that as long as the team continues to have three of its spots occupied by Caterpie, Magikarp and Feebas, then it quite certainly cannot ever be a "good" team. However, if I am allowed to suggest removing those Pokémon, then consider this: As much as many people may not want to admit it, almost every trainer holds an opinion about what the "objective best OU team" is. In fact, I would say that in almost all cases, "the best OU team objectively" in a given person's opinion is that person's very own OU team, or if they have more than one OU team, then that would be what they think is the best out of their own OU teams, or the OU team with which they would enter any serious tournament. Let's say that a serious competitive battler joins an OU tournament. Why would such a trainer choose to enter the tournament with the team that they picked? Because in their opinion, that is the best OU team in existence, thus they believe that team would give them the highest chance of winning the tournament. Now, the goal of "rating" a team is to suggest that the team changes in such a way that it becomes as competitively viable as possible. The better a team performs after the changes suggested by a "rate" are implemented, the better said "rate" is. However, if that's the case, then what exactly would be preventing me from suggesting that the topic creator replaces his or her entire team with my personal opinion on what the best OU team is, in every single OU "Rate My Team" thread in which I participate? After all, suggesting that the creator of any OU "Rate My Team" topic replace his or her entire team with a Dragonite, Gastrodon, Landorus, Genesect, Tyranitar and Hydreigon would be doing nothing but suggesting changes that maximize the efficiency of the topic creator's team in my eyes, thus fulfilling the very goal of "rating" a team to the best of my ability. Yet posting the exact same suggestions in every single OU "Rate My Team" thread would be a huge waste of time when I could simply contribute by creating a single thread containing my opinion of what the best OU team, for everyone to see. Of course, I realize that suggesting the exact same changes in every thread would intuitively not be a valid option, but the same could be said for allowing a team containing Caterpie, Magikarp and Feebas to keep including those Pokémon. Therefore, a fine line needs to be drawn between what can and cannot be done in a "rate", and since no one has ever defined such a line before, then every "rater" must draw this line for themselves. I would like to now admit that drawing lines within gray areas is one of the things I am personally terrible at, and as such I believe that I am better off avoiding posting in "Rate My Team" threads, and instead focus on contributing to the forum in other ways, such as discussing Pokémon, moves and strategies, instead of helping people with their teams directly. For that reason, as well as the fact that I generally don't like revealing my teams to the public in fear that others may be able to refer to their knowledge of such to gain an advantage against me if they happen to cross paths with me in battle, it has been more than half a decade since I last created a "Rate My Team" thread. But today, I will make an exception to that. Due to a combination of my declining luck in recent battles, which resulted in a number of my names falling by huge amounts of points on the DW Ubers ladder and thus dulling much of my interest and inspiration in competitive battling, my need to dedicate a portion of my time to my University studies now that my long holidays have ended, as well as my sudden and recent inspiration to work on a Pokémon fanfiction that I thought I had given up on almost two years ago, I have decided to take a temporary break Pokémon Online (the servers, that is. I will still post on these forums as well as on Dragon Rush though), and will not return until after the release of Pokémon Black 2 and Pokémon White 2 along with BlackKyurem, WhiteKyurem and any new move tutor moves introduced in those games being made available for use on Pokémon Online (which I believe is sure to have a great impact on the nature of the DW Ubers metagame). I will now allow all five of my names on the DW Ubers ladder to decay in points through inactivity, until each and every one of them is well out of the sight of the top 40 names on that ladder. And long after that, I will return to recover all five of those names from the depths of decay, as an initiation of a new beginning, which will hopefully be void of the massive amounts of misfortune that I have experienced on the battlefield in the past few days, as well as in the presence of a resurrected inspiration to participate in the wonderful game of Pokémon (which I believe is sure to come with the the impending arrival of two shining, new and awesome Übers to the metagame - BlackKyurem and WhiteKyurem). Because of my upcoming absence from Pokémon Online (removing the consequence of anyone gaining an advantage against me in battle through their knowledge of my team), as well as the fact that the DW Ubers metagame will most likely look vastly different upon my return due to the introduction of BlackKyurem, WhiteKyurem and new move tutor moves (which may very well possibly, in time, unfortunately or otherwise depending on how one looks at it, render this current team of mine unusable in that coming new metagame anyway), I will, for the first time in a long time, reveal one of my teams to the public. And in spite of the view on "Rate My Team" threads that I have expressed above, I have decided to make this thread anyway, as the purpose behind its creation is not so much to seek advice, as welcome as constructive criticism and opinions are here, but rather, to create a shrine in tribute to what I personally believe to be the most successful DW Ubers team ever, since I intend for the light of its glory to live on in some form even in my absence from Pokémon Online (and thus the team itself's absence from the battlefield). I have personally battled using a wide range of different-styled teams in the DW Ubers tier: Rain stall, rain offense, hyper offense, rain bulky offense, and even a Calm Mind Arceus-centric team. However, in spite of all the different teams I have tried, I do not believe that any of them come anywhere close to this team which I am about to present before you. Utilizing what I personally believe to be the best weather in the Übers tier contrary to popular opinions, alongside two excellent defensive cores, and paralysis support along with two of the deadliest sweepers to have ever graced the Übers tier thanks to their excellent offensive type combinations giving them near- or completely unresisted Same Type Attack Bonus attacks, it is, in my opinion, the closest I can personally think of to being a "perfect" Über team, as evident by the amount of success it has achieved on not only the DW Ubers ladder on the Pokémon Online server, but also the equivalent of such on both the Reborn server as well as the PokéBattleCenter server, having reached #1 on the ladder of both of those servers at some points in the past as well. This, along with the fact that I have put much more time and effort into refining and perfecting this team than any other Über team I have ever created, is why Flames of the Heavenly Light is the Über team that I am personally the most proud of. Ever since it was first revealed on the 28th of May, 2010, and especially after the later revelation of its epic type combination, Reshiram had been my favorite of all Generation V Pokémon, as well as my favorite Über ever and my second favorite Pokémon overall. As such, there was no doubt upon the advent of the Generation V Übers metagame that I would include the Vast White Pokémon in my team. After the inclusion of the mighty fire dragon, it was almost instinctive that the next Pokémon I believed would be appropriate for the team would be Groudon, thanks to its ability to summon the Sun, the very power source which transforms Reshiram's mighty Blue Flare attack from a move that is essentially a weaker and less accurate Overheat with a 20% burn chance as well as no Special Attack drop, to one of the most terrifyingly powerful techniques in existence, capable of destroying any bulky Water-type Pokémon (including Kyogre, if the Sun is shining brightly in its presence for some reasons) in two clean hits, incinerating Arceus, the God of the Pokémon world Himself in a single neutral blow, and even take out frailer Pokémon that resist the move, such as Chandelure and Blaziken in a single, devastating blast! At this point, almost as instinctive as the inclusion of the Continent Pokémon following Reshiram, was the use of the Rainbow Phoenix, Ho-Oh - the only Fire-type Pokémon in existence that is on the same level as Reshiram, and works as an excellent teammate for it by abusing the Sun alongside the Vast White Pokémon, destroying any foes that are defensively weaker on the physical side, while leaving those that are defensively weaker on the special side up to its partner. As things stand, I have included in my team what is very obviously one of the most potent offensive combinations in the Über tier. However, the functioning ability of this combination can only last as long as the opponent does not remove my Reshiram and Ho-Oh's beloved sunlight by replacing it with a different weather. And thus, for that reason, I took care to deliberately include in this team a Pokémon that can destroy the most popular weather summoner in the tier, which also happens to be most-used of all Pokémon in the entire tier (if one were to include each Forme of Arceus as a seperate Pokémon) - Kyogre, dubbed "the King of Übers" by many trainers across space and time. The first Pokémon I turned to for this role was Zekrom, as I was interested in using it due to its cool-looking appearance, the fact that it was a new Pokémon, the fact that I found something aesthetically awesome about including both Reshiram and Zekrom in the same team, as well as because from a glance, it seemed like the most obvious choice for a Pokémon intended to destroy Kyogre due to its Water resistance as well as its ability to slay the Sea Basin Pokémon with its powerful super effective signature move, which also hits Kyogre on its weaker physical side. Witnessing the massive weakness to Stealth Rock that this team spots due to the presence of my two main sweepers, including one which also has Flying as a secondary type, I then decided to place Thundurus in my team (as ironic as it may be due to Thundurus's Flying type) as a lead to use Taunt to stop my opponent's leads from setting up the aforementioned entry hazard, since it was the default Pokémon I used at the time for the purpose of countering entry hazards, even in OU, as I did not (and still do not) like using the move Rapid Spin due to the ease with which it can be blocked by a Ghost-type Pokémon, as well as the fact that for purposes other than stopping entry hazards, I found Thundurus to be overall a lot more useful than both of the Magic Bounce Pokémon - Espeon and Xatu, mainly due to the Bolt Strike Pokémon's access to priority Thunder Wave, which can be very helpful in Übers. After this, I mistakenly believed that my team had all of its weaknesses covered, so I decided to just throw one of my favorite Pokémon into the team - the original Über - Mewtwo, just to increase the team's offensive power as I couldn't think of anything better to put into the team at the time. It could also abuse the sunlight provided by Groudon somewhat with Flamethrower. Having placed six Pokémon into my team, I then decided to head to the battlefield on the PokéBattleCenter server. I did win some battles, but eventually found out that it was very weak to Extreme Killer Arceus. As such, I took out the most replaceable Pokémon in the team, Mewtwo, and put a Choice Scarf Terrakion in its place, which also served as a general revenge-killer. Upon experiencing more battles, I realized that despite the inclusion of the mighty Zekrom in this team, it still suffered devastating defeats at the hands of many Kyogre, especially those carrying a Choice Scarf, mainly due to the Deep Black Pokémon's weakness to Ice Beam and inability to take Water Spouts very well despite its resistance to the latter, due to that move's sheer destructive power. As such, I replaced Zekrom with a much more reliable Kyogre counter, Palkia. And it was with the placement of Palkia over Zekrom which was when the team began to rise to greatness. 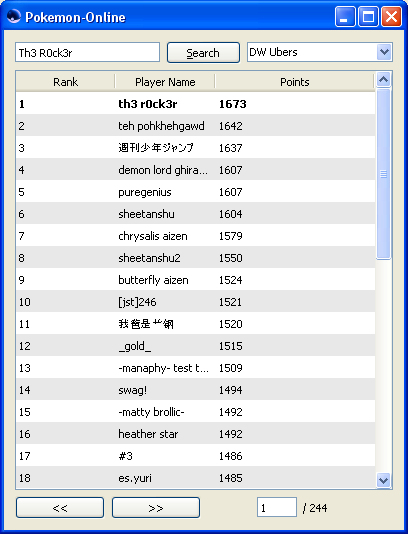 Under the name PLASMAAAAAAAAAAAAAAA, I climbed to #1 of the Gen5 Ubers ladder on the PokéBattleCenter server. Perhaps the team at this point owes its success to the excellent defensive core that Groudon, Palkia and Ho-Oh collectively embody, since Groudon easily absorbs any Electric and Rock-type attacks aimed at Ho-Oh or any Outrages aimed at Palkia; Palkia has the gem that is its 4x resistance to Water, the common weakness of Groudon and Ho-Oh, and Ho-Oh easily tanks Ice (considering most moves of such type are special) and Grass-type attacks aimed at Groudon as well as Spacial Rends, Dragon Pulses and Draco Meteors aimed at Palkia, thanks to its grand Special Defense. Yet in spite of that, the team didn't seem like it could stand up to the might of the trainers on the Pokémon Online server, so I figured that one final change to the team was necessary. I believed that Thundurus was insufficient for keeping Stealth Rock off the field, since many people did not lead with their user of this move, so I replaced it with an Espeon, despite knowing that it would not be overall as useful as Thundurus. And with the departure of the Bolt Strike Pokémon, I realized that my team was now very much in need of paralysis support, since I remembered how much Thundurus's Thunder Wave used to benefit my team. And so my immediate thought was to replace Terrakion with a Pokémon that could both counter Extreme Killer Arceus and spread paralysis. Very soon, I found one, that being the legendary Diving Pokémon, Lugia. Back when Thundurus was on my team, I had already contemplated on replacing Terrakion with Lugia, but was put off from that idea due to the Sea Guardian's lack of offensive presence, which could easily allow a Pokémon like Ferrothorn or Forretress to come into it and set up Stealth Rock, heavily crippling my team. But now that Thundurus was replaced by the far more effective entry hazard counter, Espeon, I then welcomed Lugia, which would prove to be one of the most helpful Pokémon in my entire team. With the help of these two Psychic-type additions to my team (which also create a very decent defensive core together thanks to Espeon's immunity to Thunder Wave, Toxic and Will-o-Wisp, which greatly cripple Lugia, Espeon's ability to protect the team against Stealth Rock, which heavily impairs Lugia's usefulness by destroying its Multiscale, as well as Lugia's ability to wall just about every offensive Pokémon in existence, much in contrast with Espeon) I then climbed the DW Ubers ladder on both the Pokémon Online server and the Reborn server rapidly, eventually reaching #1 on both ladders (in the latter, I had reached #1 without losing a single battle on my journey there - a true testament to the power of this team). My team's lead, named after the Roman God of the Sun, is quite obviously the most important member of the team. It provides the Sun, can set up Stealth Rock (although I only ever do it if I know for sure that the opponent has neither an Espeon nor a Xatu, as it would be extremely detrimental to me if this entry hazard gets reflected by them), use Thunder Wave (which very easily paralyzes Pokémon like Latias and Latios, which very often switch into Groudon, and it is extremely beneficial for me to paralyze them, as they can then later be outrun and destroyed by my Ho-Oh's Brave Bird), and pseudo-haze with Dragon Tail, since my Groudon, as evident from its build, serves as one of my two counters to the dreaded Extreme Killer Arceus, the ultimate Pokémon. Groudon is also my answer to Zekrom, one of the few Übers that cannot be walled by Lugia, as well as the Pokémon that covers my team's massive weakness to Rock-type moves, thanks to its maximized physical bulk as well as its natural resistance to such attacks. This Espeon, named after the Shinto Goddess of the Sun, is my team's counter to entry hazards, as not only do I, as a trainer, have personally strongly disliked battling with entry hazards on my side of the field even back in Generation II (where not only was Spikes the only entry hazard in existence, but only one layer could be set up back then), but this team also absolutely dreads entry hazards, especially Stealth Rock, since it disables Lugia's Multiscale upon switching in on top of giving it 25% damage, deals a massive 50% damage to Ho-Oh while at the same time completing putting a halt to its ability to abuse Regenerator, and thus severely denting its walling abilities, and also deals 25% damage to Reshiram, which has no way of recovering from that damage. Focus Sash is the item of choice on this Espeon, due to its frailty as well as the fact that it saves the Sun Pokémon from being destroyed in a single hit by the attacks of many common Stealth Rock users, such as Dialga's Draco Meteor and Groudon's Earthquake. Grass Knot is there as it allows Espeon to deal a massive amount of damage to Groudon, one of the most common users of Stealth Rock, while with its Focus Sash, it can also serve as a failsafe which can heavily damage Kyogre, one of the most threatening Pokémon to this team, if Palkia, the team's main counter to the Sea Basin Pokémon is somehow taken out. Psyshock is Espeon's main attack, and it is used over Psychic for its ability to deal a decent amount of damage to Chansey, which is not an uncommon user of Stealth Rock and is also a Pokémon which Espeon is meant to wall, as well as being able to destroy Tentacruel in one hit, as that is one of the most common users of Toxic Spikes, another entry hazard which this team really dislikes. Morning Sun's main purpose is to allow this Espeon to be able to completely wall any Chansey with Seismic Toss, especially given the boost that Groudon's Drought provides for the healing power of this move. And last but not least, Yawn is a very cool move with a number of functions. Firstly, it allows Espeon to force many of the Pokémon it cannot defeat with its attacks to either switch or fall asleep - most notably Dialga, a very common user of Stealth Rock. Secondly, after switching in and reflecting the opponent's entry hazard with Magic Bounce, unless the opponent has a Lum Berry Pokémon or a Magic Bounce Pokémon themselves Espeon can then use Yawn repeatedly, forcing the opponent to either keep on switching between their Pokémon and racking up damage on their team due to their own entry hazard that they set up upon themselves, or finally give up and let one of their Pokémon fall to sleep. And lastly, Espeon with Yawn also serves as a perfect counter to Smeargle that utilize Spore, Shell Smash and Baton Pass, which can be very difficult to stop by other means. The Spatial Pokémon, named after the Norse Goddess of the Sun, is the team's primary counter to what many refer to as the Über King - Kyogre. On this Palkia, Leftovers is my preferred item, since a higher degree of survivability is, in my opinion, necessary for a Pokémon whose main purpose is to counter a powerful attacker like Kyogre. However, at the same time, I decided not to invest any bulk into this Palkia side from the 4 EVs in HP, as while I consider survivability to be important for a Kyogre counter, equally so is the ability to outrun any Kyogre that do not hold a Choice Scarf, as a difference in Speed makes a world of a difference. And with enough Speed EVs to outun any non-Choice Scarf Kyogre, I figured I may as well speedtie with any Palkia that do not hold Choice Scarf as well anyway, leading to my settlement with a strange Palkia that has an offensive EV spread, yet a defensive item. The inclusion of Thunder as well as Palkia's signature move are self-explanatory at this point, while Hydro Pump is to serve as an insanely strong attack under the rain, whose power almost matches that of Reshiram's legendary Sun-boosted Blue Flare, and can be used to deliver a massive blow to any Extreme Killer Arceus that dare to attempt to set up on my Palkia after it had done its job of slaying a Kyogre. For the last move, I chose Fire Blast, as it is the only move in Palkia's arsenal that allows it to take down the most specially defensive of Ferrothorn in two hits in the rain, since both Aura Sphere and Flamethrower fail to manage such a feat. To this team, Palkia being able to take down Ferrothorn in two hits in the rain - once as the opponent switches out their Kyogre and send out their Ferrothorn anticipating Thunder, and again on the following turn - is extremely valuable, since Ferrothorn is a very common Stealth Rock user that cannot be beaten by Espeon, and can also heavily damage Espeon with its powerful Gyro Ball and Power Whip attacks. Aside from being able to effectively hit Ferrothorn, one of the most common switch-ins to Palkia in the rain, Fire Blast is also a very nice move to abuse in the Sun, as in that weather, its power surpasses even that of Spacial Rend. I have also encountered a good number of Groudon and Dialga that could survive two Spacial Rends from Palkia, but not a Spacial Rend plus a Sun-boosted Fire Blast, making Fire Blast a very useful technique for disposing of such Pokémon as well. My Lugia, named after the Hindu God of the Sun, is the team's primary provider of the paralysis support, as well as the primary pseudo-hazer. It is the ultimate wall in all of Pokémon, and its main duties include badly poisoning and Whirlwinding out any Extreme Killer Arceus, offensive sweeping Groudon or Garchomp, or paralyzing any Latias, Latios, Mewtwo, Palkia, Rayquaza, Blaziken, Calm Mind Arceus or Kyogre (only if it comes into Lugia itself), and leaving them to be outrun and finished off later by another Pokémon, usually Ho-Oh. The EVs are designed to give Lugia maximum HP, enough Speed to outrun the myriad of Pokémon with base 90 Speed that run 252 EVs in Speed along with a Speed-raising nature, and the rest of its bulk is invested into its naturally lower defensive stat, its physical Defense, in order to make it a double-sided wall. This Lugia is insanely effective at completely neutralizing just about any fast and offensive Pokémon with a simple Thunder Wave, as it can manage incredible feats such as switching into a Soul Dew Latios's Thunder or a Mewtwo's Ice Beam that is half-powered thanks to Multiscale, taking a fully-powered Thunder or Ice Beam following that and then paralyzing Latios or Mewtwo, before using Recover repeatedly until it ends with a turn in which Lugia has its Multiscale intact thanks to a paralyzed Pokémon's 25% chance of being fully paralyzed, and then leaving the opponent's Pokémon to be finished off later on either by my Life Orb Ho-Oh's Brave Bird in the case of Latios, or its devastating Sun-boosted Sacred Fire in the case of Mewtwo. This Lugia, with its Toxic stalling capabilities, can also serve as a surprisingly effective offensive force against some teams. This Ho-Oh, named after the Egyptian God of the Sun, is one of the two main sweepers in my team. Its moveset seems very simple and straightforward from a superficial perspective, but in fact, it actually allows this Ho-Oh to be one of the deadliest and most versatile Pokémon in existence, being a wall breaker, a special wall, and a sweeper all in one, making it one of the most perfect Pokémon in existence, aside from its desperate need of Drought and Magic Bounce support. This Ho-Oh is quite arguably the most useful member of this team, simply because of the vast number of things it can do in many different situations, including, but in no way limited to: 1. Walling any Reshiram that lack a Rock-type move, something almost no other Pokémon can do; 2. easily disposing of Substitute Darkrai provided it had put another Pokémon to sleep previously, thanks to its ability to raise its Speed while simultaneously breaking Darkrai's Substitute with Flame Charge; 3. reducing Ferrothorn and Forretress (provided it has less than 100% health), two very common Pokémon to nothing more than setup bait with Flame Charge; 4. easily absorbing Draco Meteors and Recovering or Regenerating off a significant amount of the damage (it can take a Choice Specs Draco Meteor from even one of those dragons with a 150 base Special Attack! ); 5. tanking Giratina's (and some Dialga's) Dragon Tails indefinitely, by repeatedly sending Ho-Oh in against it, taking less than 33% damage per hit while recovering exactly 33% damage every time it is called back, in effect doing nothing but wasting the PP of the opponent's Giratina or Dialga while Ho-Oh itself does not take any net damage whatsoever, and may in fact even be healed in the process if the Rainbow Pokémon had taken some damage beforehand (Ho-Oh's ability to do this is made especially useful due to its immunity to Will-o-Wisp, which is usually Giratina's only other form of offense); 6. using Sacred Fire which has a chance of burning any Extreme Killer Arceus foolish enough to attempt to set up before Ho-Oh (while at the same time heavily damaging Arceus provided the heavens are filled with intense sunlight), crippling the Original One for the rest of the match; 7. easily beating any Calm Mind Arceus (provided it is not of the Rock, Electric, Water or Dragon type); 8. serve as a pivot to switch from Groudon to Lugia against Mewtwo, so that Lugia ends up taking a Psystrike on the switch rather than an Ice Beam; 9. using the myriad of Pokémon it completely walls in the Sun, including Palkia, Reshiram, Latias, Espeon and special attacking Arceus as complete setup fodder; 10. smashing through walls very easily thanks to its pair of absurdly powerful and near-unresisted physical Same Type Attack Bonus moves, which, among commonly-used Pokémon in Übers, are resisted only by Zekrom and Tyranitar, both of which loathe a burn from Sacred Fire (and additionally, there is the fact that Ho-Oh is a physical attacker whose attacks just so happen to be able to beat most common physical walls in Übers, making it very close to unstoppable as special walls obviously also cannot wall it); 11. sweep teams very easily after one or two Flame Charges and the opponent's Kyogre is down, largely thanks to its aforementioned insane offensive power; 12. taking close to nothing (and in fact, in the grand scheme of things, absolutely nothing factoring in Regenerator) from the very common U-turns of Genesect; and last but certainly not least; 13. serving as a great Kyogre lure, as its Life Orb Brave Bird simply deals a tremendous amount of damage to any Kyogre switching into it expecting a Sacred Fire, possibly taking it out in a single blow after just one round of Stealth Rock damage. Finally, we come upon Reshiram, the star of this team, named after the Greek God of the Sun. When its stats and movepool were first revealed, many people dubbed Reshiram to be "the Kyogre of the Sun", and such a name was, in my opinion, given very aptly, as the power of its Sun-boosted Blue Flare almost rivals that of Kyogre's rain-fueled Water Spout, making it just as ideal a Choice Scarf Pokémon as Kyogre is very well known to be. Its Blue Flare in the Sun absolutely devastates everything, including many Pokémon that sport a 2x resistance to this move (being able to destroy some of them even in one hit), and this, combined with its blazingly high Speed due to its item, can make it very difficult to stop in the same manner as Choice Scarf Kyogre. Its Draco Meteor is also especially devastating, as Steel-type Pokémon, the only Pokémon that resist this move, are all extremely reluctant to switch into it due to the aforementioned terror that is its signature move. Being the very Pokémon that is most famous for having a pair of absolutely (not just relatively, mind you, like in Ho-Oh's case) unresisted Same Type Attack Bonus moves when combined with its great Ability, the Vast White Pokémon has very little need for much else except for the aforementioned two moves. As such, for one of the two remaining moveslots, I have opted to put in Stone Edge, a move which can come in handy against Ho-Oh (which gives this team a lot of trouble, especially due to my reluctance to set up Stealth Rock against teams that use this Pokémon, as such teams almost always contain a Magic Bounce Pokémon, and as I already mentioned, allowing such a Pokémon to reflect my Stealth Rock upon my own field puts me at a massive disadvantage), which more than likely stay in against, or often even switch into Reshiram, since Ho-Oh typically completely walls Reshiram in the absence of Stone Edge, a move it almost never runs. As for the final move, I chose Outrage, an attack that it almost never uses, but can prove to be useful in very desperate situations, such as against bulky Calm Mind Latias as the opponent's final remaining Pokémon when Ho-Oh has already fainted (as even Draco Meteor cannot take it out in one hit), or against Chansey in the rain. Since I will not be using this team for a while in the future (in fact, there is even a highly probable chance that I may never use this exact team again, due to the metagame changes that will be brought about by the release of Pokémon Black 2 and Pokémon White 2), I will allow anyone who is interested in using this team to use it for themselves, as a way for it live on in my absence. : Completely countered by Palkia. If it somehow takes down Palkia due to absurdly good predictions by hitting it enough times with Thunder on the switch (which has rarely ever happened), I can play around it, by trying to paralyze it with Lugia, hitting it with my Choice Scarf Reshiram's Draco Meteor to weaken its Water Spout (although it would need to win a speed-tie against Timid Choice Scarf Kyogre), try to set up a Flame Charge with Ho-Oh if Kyogre isn't out and then smashing it with Brave Bird it as it shows up (although unless it gets two or more Flame Charges, it would need to win a speed-tie against Timid Choice Scarf Kyogre, just like my Reshiram), or simply Brave Bird it if is does not hold Choice Scarf, heavily damage it with Espeon's Grass Knot, switch Groudon into any Thunders aimed at Lugia, weaken it with Stealth Rock damage, and such. : I normally Toxify and Whirlwind it out with Lugia, or Earthquake or Dragon Tail it with Groudon if Lugia is in no condition to counter it, depending on whether or not Arceus had gained a Swords Dance boost. If it comes into Ho-Oh, I can heavily damage and possibly burn it with Sacred Fire. If it doesn't burn, I can then switch to Lugia or Groudon. If Reshiram somehow gets the chance to attack Arceus before it gets any Swords Dance boosts, Reshiram can even incinerate the Original One in a single Sun-boosted Blue Flare if it happens to be foolish enough to stay in. If all comes to worse, I could also fodder Espeon against it, since it would most likely have done its job by the time Arceus-Normal shows up. : Easily paralyzed by Lugia (and often, even by Groudon on the switch). After that, it is easily destroyed by Ho-Oh's Brave Bird. If necessary, Reshiram can revenge-kill it with Draco Meteor. : Espeon reflects its Stealth Rock and can heavily damage it with Grass Knot, Reshiram's Sun-boosted Blue Flare destroys most Groudon in a single hit (although it cannot switch in), and Lugia easily Toxic stalls any offensive Groudon. Palkia and Ho-Oh can both take down most Groudon that are sufficiently weakened. : Most, like mine, rely purely on status moves, and as such cannot touch Espeon (and in fact, it would even be beneficial if it uses Toxic and hits my Espeon on the switch, badly poisoning itself). Calm Mind variants are either Toxified and Whirlwinded out by my own Lugia, or incinerated through repeated hits of my Ho-Oh's Sun-boosted Sacred Fire, succumbing to the repeated heavy assaults alongside the burn that ruins its Multiscale long before it can gain enough boosts to pose a significant threat to Ho-Oh, thanks to Lugia's low 90 base Special Attack compared to Ho-Oh's grand 154 base Special Defense. Reshiram is also exceedingly useful against Toxic stall Lugia if Espeon had been defeated previously, as with Turboblaze bypassing Lugia's Multiscale, Reshiram can fell the diving Pokémon with two Sun-boosted Blue Flares. : Easily paralyzed by Lugia. After that, it is easily destroyed by Ho-Oh's Sun-boosted Sacred Fire. If necessary, Reshiram can revenge-kill it with its Sun-boosted Blue Flare. : Admittedly, it is one of the more problematic Pokémon for my team, as it is a common Stealth Rock user that fears nothing from anything my Espeon can do other than Yawn. It can, however, be played around with sufficient prediction. Stealth Rock lead Dialga can sometimes be manipulated to fall asleep by my Espeon's Yawn after Espeon reflects its entry hazard on the switch, as at that point I can keep using Yawn, forcing my opponent to either keep switching and taking Stealth Rock damage, or have one of their Pokémon fall asleep. If I predict my opponent predicting me switching to Espeon, I could also simply attack it with my Groudon's Earthquake or my Ho-Oh's Sacred Fire if they happen to be out, and after being weakened by one of those attacks, it should be easily taken out before it can use Stealth Rock (maybe even giving Ho-Oh a free Flame Charge). Also, Reshiram can incinerate Dialga in a single Sun-boosted Blue Flare if it needs to. If the opponent has Kyogre, I could then switch to Palkia, at which point my opponent usually switches back to Dialga expecting a Thunder, only for me to take it out with two Spacial Rends - the first on the switch, and the second one on the following turn (although unfortunately, they could also switch to Ferrothorn, making the choice between Spacial Rend and Fire Blast difficult). Specially defensive Dialga could be a problem in this situation though, as they can survive two Spacial Rends, though fortunately, Spacial Rend does have a high critical hit ratio, allowing Palkia to defeat Dialga in two hits anyway if it scores one critical hit, as unreliable as such a strategy may be (but hey, no team is perfect in an absolute sense). All other variants of the Temporal Pokémon, such as Choice Scarf, Choice Specs and Bulk Up are countered easily by Lugia and Ho-Oh (although only the latter can actually defeat it), or even destroyed by Reshiram, although it obviously cannot switch in. : Could be troublesome if it comes into Lugia or Groudon, as it can heavily damage Espeon on the switch, while Espeon can do little back other than Yawn. However, it is destroyed in one hit by Palkia, Ho-Oh (being even free Flame Charge material for it) and Reshiram. It is only possibly a threat if it has Stealth Rock and the opponent manages to outpredict me. : The only Pokémon it really threatens are Groudon and Espeon. Trapping the former is rarely problematic as Chandelure is almost never used alongside Kyogre anyway, meaning that losing my Groudon to a Chandelure's Overheat rarely means losing the weather war, since my opponent is most likely using the same weather as me anyway. Trapping the latter could cause some trouble in some situations, but with Focus Sash allowing Espeon to survive the initial Shadow Ball, as well as Yawn which threatens to put Chandelure to sleep if it wishes to stay in to finish off Espeon, the Sun Pokémon could survive once against it, since most people are reluctant to let their ultimate revenge killer get disabled just to eliminate an Espeon. : Quite a threatening Pokémon that requires a lot of prediction to easily beat. Usually, I rely on Espeon to reflect its Dark Void. If it does something like Trick or Substitute on the switch, I generally let Groudon sleep and then use Darkrai as setup bait for my Flame Charge Ho-Oh. If necessary, I can use Reshiram to revenge-kill it with one of its powerful special attacks. : Walled completely by Ho-Oh, and to a lesser extent Reshiram. : Another one of the more problematic Pokémon for this team, due to the sheer power and coverage of its Brave Bird and Sacred Fire attacks alone. The closest thing to a true counter I have for it is Lugia, which cannot do anything back to it other than Whirlwind if Ho-Oh is of the extremely common Substitute set, while Sacred Fire's burn chance can also be extremely detrimental to Lugia as it negates the Psychic/Flying-type Pokémon's Multiscale. Fortunately, just about every Ho-Oh user I have faced have had their Rainbow Phoenix unexpectedly crushed by the Stone Edge of my Reshiram, a Pokémon which they so confidently believed that their Ho-Oh could easily wall. Since most Ho-Oh do not invest anywhere near as much Speed as mine does, my Ho-Oh can generally beat other Ho-Oh one-on-one too. If I somehow manage to take down my opponent's Espeon or Xatu, I can much more easily keep my opponent's Ho-Oh at bay through my Groudon's Stealth Rock. : Despite its weakness to Ghost-type moves, I generally go to Lugia when I see it and paralyze it first before Whirlwinding it out. If it is a Swords Dance set, I then deal with it using either Groudon or Reshiram, while if it utilizes Calm Mind, I use Ho-Oh. : Groudon completely stops most Zekrom cold, although the Choice Band one, especially at the hands of an opponent skilled at predicting, could pose some threat. However, a Choice Band Zekrom locked into Outrage can easily be disposed of by either Palkia or Reshiram. : Very simple to get around. Espeon reflects any entry hazards it attempts to set up, before proceeding to nullify its Sturdy with a simple Psyshock. At that point, I can then either use Yawn, or if I know that they have Gyro Ball and feel like taking a risk, I could immediately switch to Ho-Oh and use Forretress as Flame Charge fodder. If it comes into Palkia or Reshiram with less than 100% health, it is also equally dead for obvious reasons. : Can be easily paralyzed and Whirlwinded by Lugia, which can take even a +2 Sun-boosted Flare Blitz while losing less than 50% of its health thanks to Multiscale. Once it is paralyzed, the next time it comes in, just about everything in my team can take it out. : Completely walled by Lugia and to a lesser extent, Ho-Oh in the Sun. Once Lugia paralyzes it, I can then go to Ho-Oh and destroy it with Brave Birds if the weather is sunny, otherwise I Whirlwind it out and wait until later on in the match, when the opponent's Palkia finds itself in the Sun. Non-Choice Scarf Palkia can be simply revenge-killed by my Choice Scarf Reshiram. : Completely walled by Lugia, and can be taken down quite easily after being paralyzed. : Countered by Ho-Oh unless it has Stone Edge, although I have never seen anyone other than myself using Stone Edge on Reshiram, aside from a certain friend of mine (who personally got the idea of using Stone Edge on Reshiram from me), who used a Flame Charge Reshiram with Stone Edge, against which I utilized intelligent switching and predictions involving Palkia to get it to use Draco Meteor against my Lugia, halving its own Special Attack, at which point I then paralyzed it, essentially neutralizing it. : Countered by Ho-Oh for the most part, although Psyshock does inflict a decent amount of damage to it, but such damage can easily be healed off with Regenerator by switching to Lugia, which takes close to nothing from Psyshock. Ho-Oh can usually use Espeon as Flame Charge material. : Easily paralyzed by Lugia and then taken out by Ho-Oh. Ho-Oh by itself can also often beat it. Reshiram could also revenge-kill it with Draco Meteor provided it has taken some damage beforehand and acquired no Calm Mind boosts, otherwise Outrage destroys it in one hit, although locking Reshiram into Outrage is often extremely risky. Latias is often paralyzed by Groudon on the switch too. : Completely walled and Toxic stalled by Lugia. Groudon can counter it to an extent too. : Every variant of this Forme of Giratina other than the physically offensive ones are walled by Ho-Oh. Reshiram can revenge-kill it with Draco Meteor. : Ho-Oh tanks its Dragon Tails indefinitely and is immune to Will-o-Wisp. Ho-Oh can also either Brave Bird Giratina, or attempt to burn it with Sacred Fire, crippling it with risidual damage from that moment forward and possibly forcing it to use Rest eventually. : Out of the top 30 most-used Pokémon in DW Ubers, Tyranitar is most likely the most threatening to my team, as not only is it one of the only two Pokémon on the list that completely counters my Ho-Oh, but it also completely counters Reshiram, removes the sunlight and replaces it with a very annoying sandstorm, and can set up Stealth Rock while threatening Espeon much more easily than any other user of this move on this list can, thanks to its ability to take the Sun Pokémon out in one hit while not even allowing it to survive due to the sandstorm knocking it out after it hangs on with its Focus Sash. Fortunately, Tyranitar is only ever used in sand teams, which pale in popularity compared to both rain and sun due to the sheer power that Kyogre and Groudon embody, as evident by the fact that Tyranitar is only the 26th most used Pokémon in the tier. When I see a Tyranitar, which is almost always a lead, I just switch to Espeon anyway as they almost always lead with Stealth Rock. After that, I'll Grass Knot it with Espeon for a decent amount of damage before sacrificing Espeon, leaving Tyranitar within the KO range of both Groudon's Earthquake and Palkia's Hydro Pump. Of course, at this point, the opponent would likely not keep their Tyranitar in, but with the damage that Tyranitar had already suffered from Espeon's Grass Knot, along with the Stealth Rock damage it takes for every subsequent time it comes in, added with being hit by some Sacred Fires, Blue Flares, Draco Meteors and Brave Birds on the switch, with the former and to a lesser extent the latter possibly burning it, along with some smart souble-switching, it could be taken down before it can set up Stealth Rock on my field. Although the good news is, even if my opponent does manage to set up Stealth Rock against me, victory would often still not be too difficult for me, as aside from Tyranitar's presence, sand teams are generally quite easy for Sun teams to defeat, mainly because Groudon completely counters most Pokémon contained in a sand team, and sand teams in Übers often carry certain Pokémon specifically to counter rain teams, making a portion of their team deadweight against my own. The only problem I can see are sand teams that utilize Arceus-Rock, which, just like Tyranitar, completely counters the two main sweepers of my team, and in a sandstorm, it could even beat Palkia due to its Special Defense boost in that weather, as well as posing as a difficult threat for even Lugia to wall, due to its Judgment being super effective against the Diving Pokémon and the sandstorm nullifying Lugia's Leftovers recovery. Fortunately though, Arceus-Rock is only #157 in usage, being used in exactly 0.5% of all teams in the tier. And the truth is, because each Pokémon team is only limited to the use of six Pokémon, each with only four moves, it is impossible to build an absolutely perfect team that has no weaknesses against any threats in the tier, regardless of how rare they may be. : Espeon reflects its Toxic Spikes and destroys it with Psyshock. : Completely countered by Ho-Oh, Reshiram, and to a lesser extent, Palkia. Also Flame Charge fodder for Ho-Oh. : Espeon reflects any entry hazards or Thunder Waves it attempts, and either Yawns or Psyshocks it. : Countered by Groudon. Palkia, Ho-Oh and Reshiram can also easily deal with it outside of the sand, although if they manage to come in safely. Ho-Oh has the best chance by switching into an Earthquake, and then even use Excadrill as Flame Charge fodder in the Sun.